Loess dominates here with deposits that delve down as deep as twenty metres. This finely-grained loess was blown to the region by prevailing winds during the period of low-vegetation and 'Ice Age' from glacier forefields, and the sediments settled down into the Alpine foothills as rock dust. Loess is always chalky with a flour-like consistency and generally has a highly porous structure. The Grüner Veltliner is an indigenous white wine variety that has gained international attention as Austria’s signature grape in recent years. 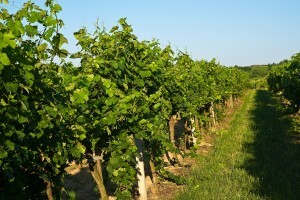 The name Grüner Veltliner is not that old; the variety was previously known as Weißgipfler (due to its light to white shoot tips) and Grünmuskateller. Fellow Veltliner namesakes include the Roter Veltliner and the Brauner Veltliner, with the prefix referring to the grape skin colour upon physiological ripeness.